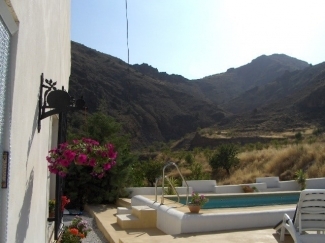 Casa Erizo is fully furnished holiday accommodation with a private pool, and is a perfect base for people who just want to "chill", romantics, walkers, cyclists, birdwatchers or artists, due to its quiet mountainous location. 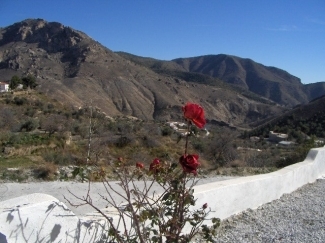 It is an old lovingly restored cortijo with 360-degree stunning views of the spectacular Sierra de las Estancias mountains and the best elevated view of the Rambla de Oria valley, nestled under Piedra de Aguila (Eagle Rock with real eagles!) and excellent for relaxing away from the crowds in real Spain. The whitewashed casa is a rural retreat and has a sitting room, dining kitchen and en suite bedroom leading to the sunbathing terrace, pool and pergola, and is set amongst olive and almond groves. 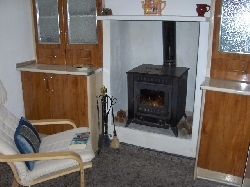 The casa has a log fire for cool evenings. There is even an internet connection for your laptop. 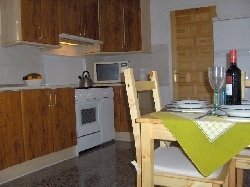 Casa Erizo is in the hamlet of Barranco de Quiles which is 5 minutes from the nearest village Oria for shops, banks, bars and restaurants, and a Sunday market in front of the church. The village dates from the time of the Moors and has the remains of a castle. 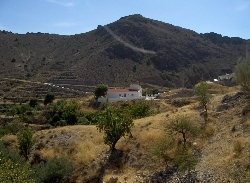 It is a farming area famous for hams and cold meats, almonds and olives. Albox is the nearest town, 30 minutes away, which has a thriving market on Tuesday mornings selling foods, clothes and local crafts. Tapas (1E a plate) and Menu del Dia (usually 10E for 4 courses) is available locally. 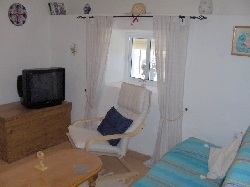 Although there are the following places to go, most people love to just relax, sunbathe and read by the pool, (shared for half an hour a day with the owners who live next door) drinking in the peace and quiet, enjoying the tremendous views, cracking open home grown almonds and watching for eagles. 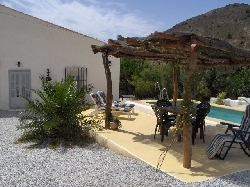 You can fly to Almeria, Murcia (San Javier), Granada or Alicante airports which are about 1.5 -2 hours drive away. If you fly to Granada, you can incorporate a visit to the Alhambra Palace on the way. We recommend that you hire a car.